Britain: Crypt of St Leonard in Hythe- Bones in the Basement. 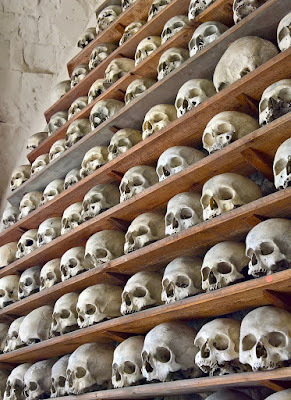 An Ossuary in South East England. That’s right, an ossuary – a room full of the skulls and bones of dead people. This is one of only two ossuaries in the UK. If you want to spend an hour looking at over a 1000 skulls and a big pile of bones from Medieval times, then get yourself down to the Hythe Crypt. The Crypt of St Leonards Church, Hythe, Kent, UK. Map. 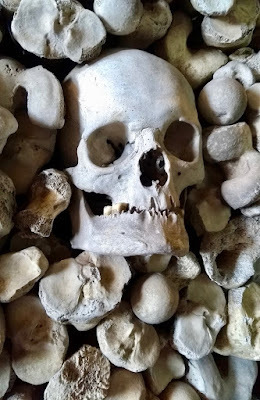 ST LEONARD'S CRYPT in Hythe is a great little place to visit if you like ever-so-slightly macabre places. 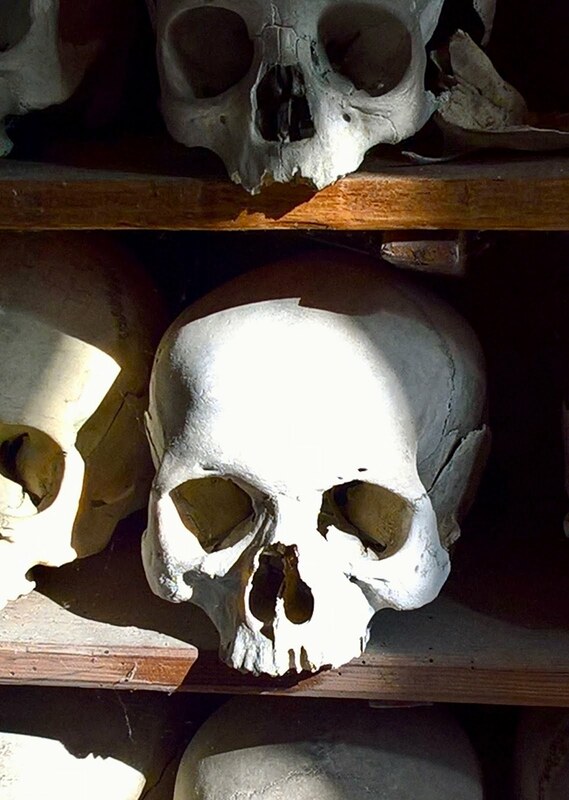 It’s small and atmospheric but not dark and morbid, and it holds the biggest and best preserved collection of human bones and skulls in the UK. We’ve visited twice; once on a beautiful autumn day when sunlight filled the room, throwing golden light onto the shelves filled with skulls and once on a spring day when the cold wind was enough to chill you to the bone. 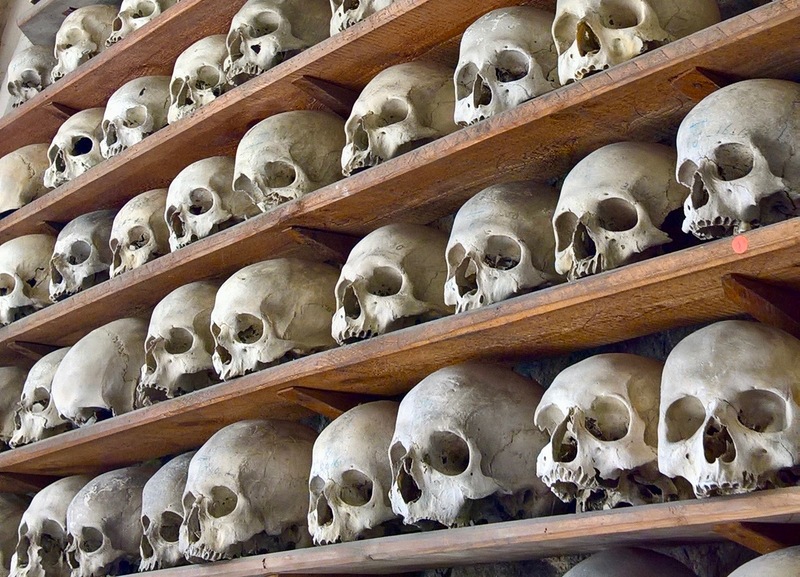 Both times the skulls were piled high, artfully placed on wooden boards, each one a reminder of our own mortality. 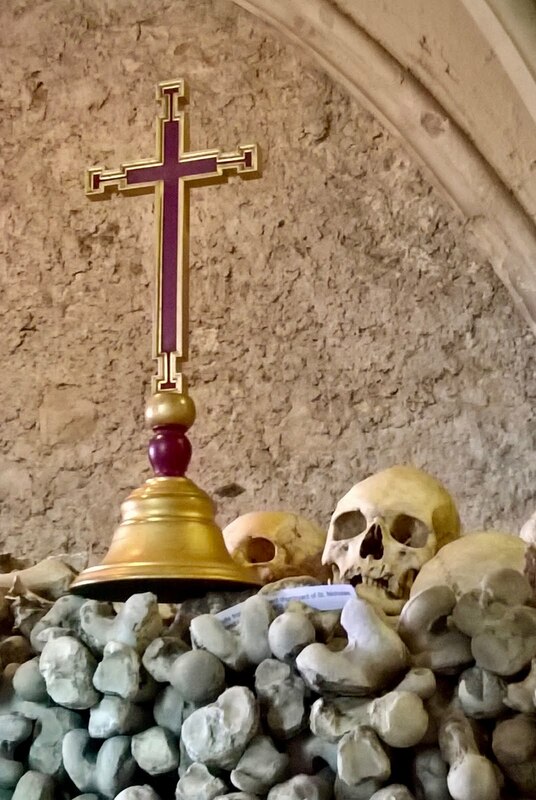 The skulls and bones were not originally arranged this way; it’s thought that this was done around 1900. Prior to that, the crypt had merely been a storage space for the bones, a kind of charnel house. All of the skulls are at least 700 years old and there have been many theories about the origin of these skulls and bones; victims of the Black Death, casualties of the Battle of Hastings, Danish pirates killed in battle. I won’t spoil the mystery for you here; you’ll have to visit this place and examine the evidence for yourself. There are several skulls that stand out, like the one showing evidence of a head injury and one with the tell-tale lump of a tumour. 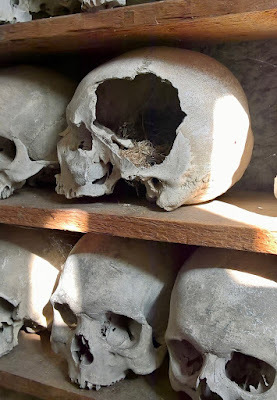 The skulls provide information about the lifestyle of local people all those years ago; a quarter of the skulls show signs of either chronic iron deficiency or malaria. The teeth also give insights into the diet of people in the medieval ages. There are very few cavities but lots of erosion due to a rough, whole grain diet (no soft white medieval bread or sweets then). There are also other interesting little exhibits like the clump of ginger hair that was found in among the bones and some tibias and femurs which illustrate what happens when bones gets broken and don’t heal properly. The wall of bones is perhaps the most macabre bit of the collection. 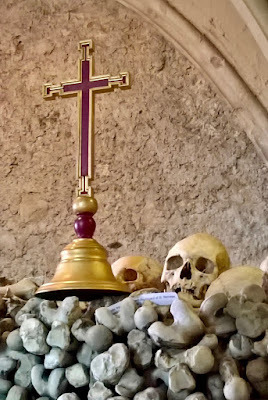 Thigh bones, interspersed with more skulls, do give a slightly eerie edge to the crypt. As I walked along the wall of bones I envisaged a bony Jenga-like avalanche if I were to stumble into them. I took a wide berth. 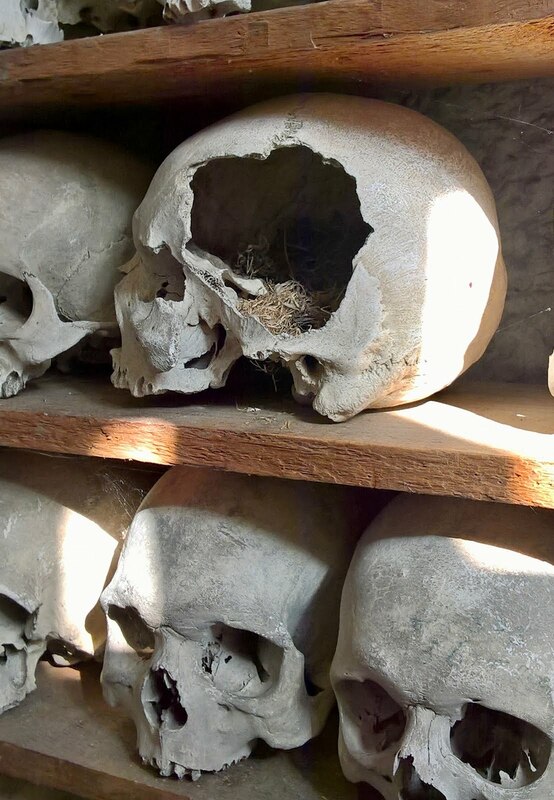 On a cheerier note, a helpful volunteer guide will point out the skull with the old bird’s nest inside, and furnish you with interesting stories for your £2 entry fee. Eerie but respectful. Dusty but educational. And don’t forget to visit the 13th century church itself which has some nice stained glass windows and not a bone or skull in sight. The Church overlooks the coastal town of Hythe so is an invigorating walk up a hill from the town and is well signposted. Hythe is a two hour drive from London. The closest mainline train station is Folkestone. 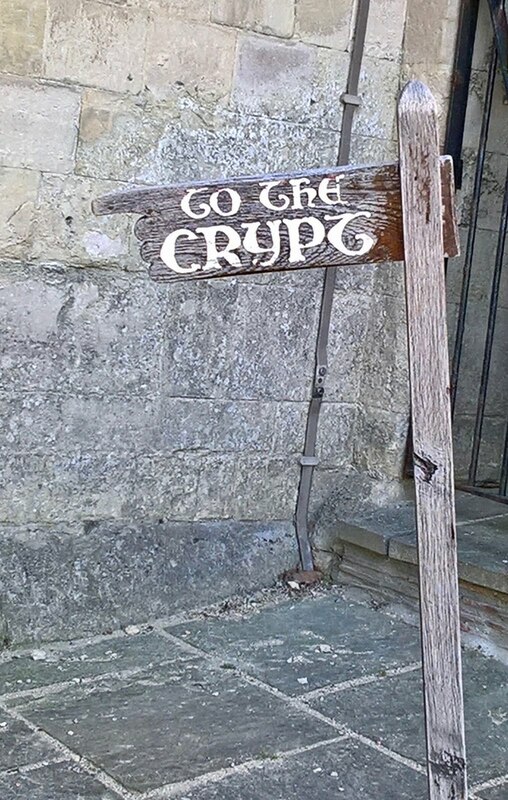 The Crypt is open for limited hours (Mon-Sat 11-1, 2-4 and Sunday 2-4) from 1st May throughout the summer months. 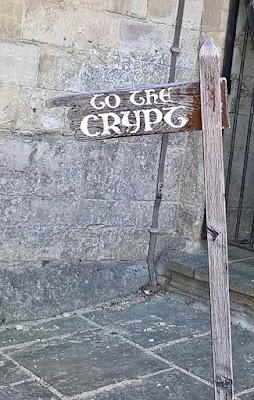 There is no website for the Crypt at the moment but contact details can be found here. Vicky Turner was born and raised in West Yorkshire in the UK but has gradually been moving South (via the East Coast of the USA) for the last fourteen years. She currently explores in Kent, in addition to the occasional sojourn in Continental Europe.